WOW… busy mom is RIGHT… I chose the perfect name for this site. With school starting back up last week for the littles in my house- things have gotten a bit BUSY! Nothing stresses me out more than trying to figure out how to keep providing healthy meals during the school year. I work full time. My husband works full time. Our kids go to youth classes at church, and play sports. What’s a Busy Mom to do? Plan ahead! 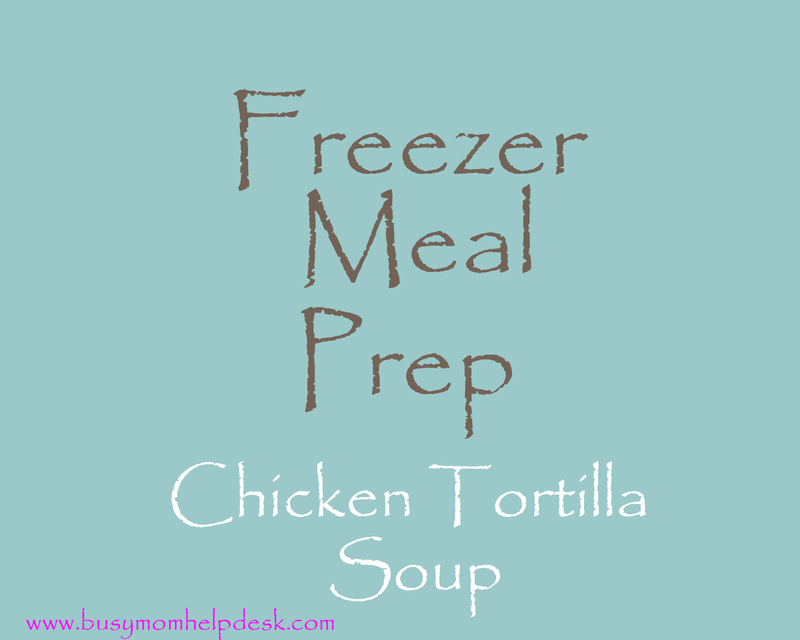 I’ve got plans to create some meals to freeze and I’ll be posting them here as I go. I’ll also share my shopping strategy to save money as I go! Unfortunately… we ate all of the soup from today’s post before I took a photo! oh no! Last week I made some Chicken tortilla soup. It was a large enough batch to divide out into smaller dishes to take in our lunches. Using the oil, sauté the onion.. Cook and stir over medium heat until onion is soft. Add cilantro, garlic and cumin. Cook about 1 minute. Stir in tortilla crumbs, chicken stock, tomatoes and beans. Simmer and cook until thick. Stir often. stir in zucchini, chicken and salt. Cook 5-8 minutes. I portioned this out into about 6 lunches. We will pretty much eat all of this this week, but if we were making it as a dinner item, we would eat one dinner protion and then freeze a dinner portion in a gallon size Ziploc brand bag. I specifically say a brand name because I have the best luck with these bags when freezing soup. You can lay them out flat without worry of them leaking. Some off brand bags are not as thick, and therefore have more of a “freezer” quality taste to the food. One way to get around that is to “double bag” when using cheaper bags… but then you lose the cost effectiveness. I do not use “slider bags” because I lay a LOT of foods flat in my freezer. Pasta sauce, soups etc. It’s too easy to bump the slider when i’m digging through my freezer. The total for this soup was under $11. We were able to split it between 5 lunches. That’s $2.20 per meal. If I buy lunch at work I can almost NEVER spend under $5. So even if I add a piece of fruit or something small to go with the soup- I am saving several dollars by taking my lunch every day!